If you have imported your pupils into Insight via a CTF, this will automatically sync your pupil's SEN information from your MIS into Insight. However, it is also possible to upload and update SEN information manually. Once this information is in Insight, you can use the filters and groups to analyse your data by SEN status. You can use the same filters and groups on most of Insight's reports, but to follow along with this example select Cohorts > Tables from the main menu. If you want to look at all your SEN pupils, click Multiple selections at the bottom to select multiple SEN statuses. To remove the filter when you have finished click the icon next to it. 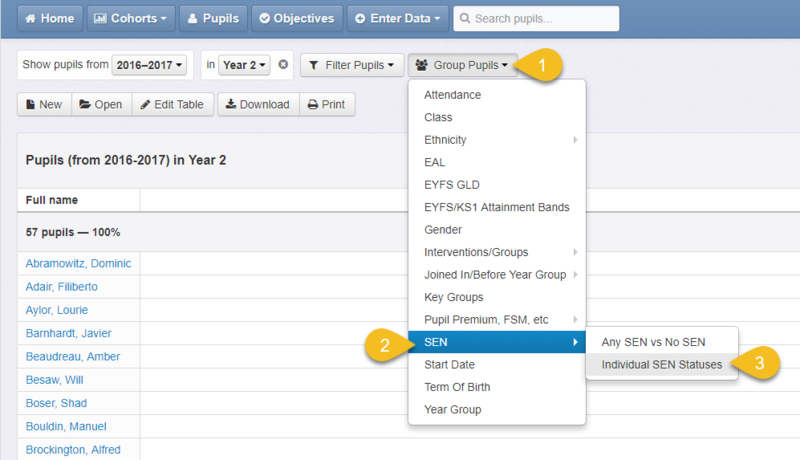 If you choose Individual SEN Statuses, Insight will group all pupils into their respective SEN groups. If you choose Any SEN vs No SEN, Insight will create one group containing these SEN pupils and one group containing everyone else. To remove the group when you have finished click the icon next to it. Older SEN statuses are included in case you need to report on cohorts from earlier years. If not, you can ignore these. If you're in Gloucestershire you may additionally be recording children as My Plan and My Plan + for Gloucestershire's SEND Graduated Pathway. As this is custom data which doesn't get pulled across to Insight via your MIS, you'll need to use Insight's Interventions and Groups functionality if you want to track this information. 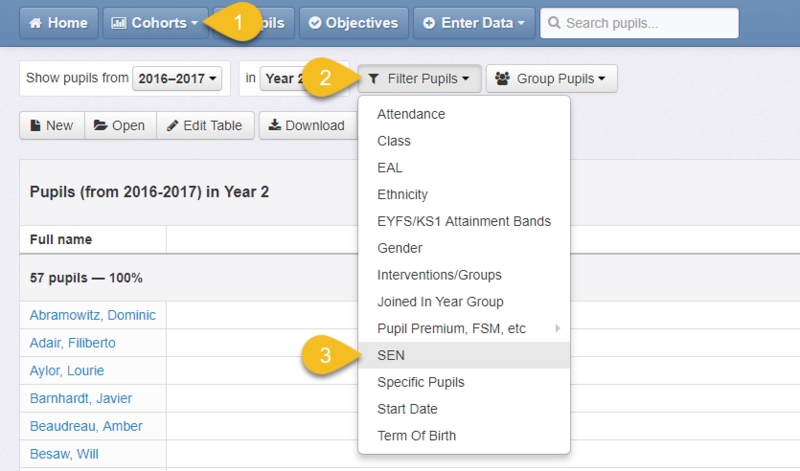 You should still be able to filter and group your pupils using the official SEN statuses.